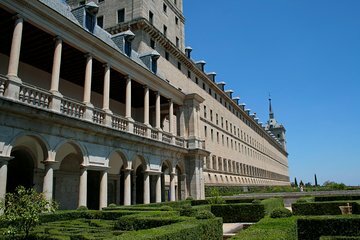 Mejora tu experiencia de dos de los monumentos más impresionantes de Madrid en una enriquecedora excursión de 5 horas al Monasterio del Escorial y al Valle de los Caídos. Con un guía profesional, adéntrese en la intrigante historia de los puntos de referencia, visitando el interior sagrado del Monasterio del Escorial y contemplando la cruz colosal en el Valle de los Caídos. Mejora tu tour para incluir una visita a la majestuosa ciudad medieval de Toledo y disfrutar de un delicioso almuerzo español. Contempla la colosal cruz que domina el Valle de los Caídos. Buyer Be Where of VPT! The company VPT offering the tour service of El Escorial and Valley of the Fallen was terrible!!! We had called in advance twice - once from the US and once from Madrid to confirm our reservation and details of the pick up at our hotel. We were told to be in the lobby of our hotel before 8:15 AM for pick up by VPT. VPT was a no show, at 8:25 AM I called the local number. VPT said they were sorry but they would not be able to pick us up as scheduled and that we would have to take a cab and arrive at their local office by 9:00 AM or forfeit the trip and of course no refund and not to mention screwing up our plans!!!!! We notified the desk and they immediately called for a taxi. We arrived barely in time, the VPT representatives did not seem to really care that we were not picked up as originally arranged. I asked to speak with a supervisor and they said no supervisor was available. The VPT guide was not great either, she mostly spoke in Spanish and her English was marginal. She rattled off her English version of what she had just said in Spanish so quickly that we missed about 50 of what she said!! We have generally had pretty good experiences with Viator but this really is a horrible operator. We are now questioning Viator's due diligence regarding service providers they rely on. The very positive part of this was El Escorial and the Valley of the Fallen, they were both excellent site seeing experiences and should be considered must see! A empresa de turismo local não nos buscou no local marcado. Após 10 minutos de atraso nos ligamos para o contato local e o mesmo nos informou que havia passado na recepção do hotel e não havia ninguém. Tivemos que transferir a ligação para a recepção do hotel que informou que fazia 20 minutos que já estávamos esperando naquele local e que ninguém havia passado lá. Mesmo assim eles não voltaram para nos buscar e disseram que poderíamos encontrá-los em outro ponto de encontro. Por isso, tivemos que sair correndo para o outro ponto de encontro... Foi muito stressante começar o dia com toda essa correria e ainda sendo chamada, injustamente, de mentirosa. Depois que entramos no ônibus tudo transcorreu perfeitamente. A guia era muito gentil e a visita guiada pelo El Escorial foi muito interessante. Pessoalmente, não gostei da energia do vale dos caídos e não voltaria lá. Enfim, não faria outro passeio com essa empresa de turismo. Very good tour and great way to have to visit two different places. Only wish that the tour company had suggestions for lunch while you wait for the 2nd part of the tour. We found a nice little bar after some searching. Muito interessante. Lindo castelo e igreja.